You know how little kids play the opposite game? It’s when they say one thing, but mean the exact opposite of it. Therefore, “I want to play”, means “I want to sleep”. I want to eat, means I’m not hungry. It’s only slightly less annoying than when they realize that you can ask why to anything! Well imagine a powerful evil spirit that thought exactly the same way! Ack! We’re talking about Akvan. 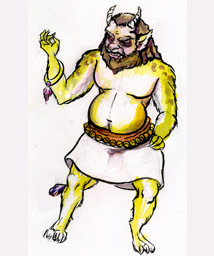 Akvan is a div, which is an evil spirit in Persian mythology whose modus operandi is to do harm to humans. Whether it’s through spreading lies or destruction, it is all done for nothing more than the pleasure of it. Of great power and strength, Akvan has the stereotypical wide mouth, fangs, and horns of a demon. He has claw-like toenails on his wide flat feet and a tail that is not quite hidden by his short skirt. Akvan is a very large and powerful example of a div, but fortunately, he is lacking in intelligence and is entirely predictable. He will always do the opposite of whatever is asked of him. Akvan is featured in the Persian epic poem Shah-Nameh. In it, Rustem, the hero, is sleeping when Akvan disrupts him with a surprise attack. Certain of his victory, Akvan asks Rustem if he would rather be thrown from the mountaintop and be devoured by the beasts on the rocks below or thrown into the sea and be devoured by whales. Well, Rustem knew Akvan’s weakness, so he said that he wished to be thrown from the mountaintop. Akvan tossed Rustem into the ocean. Since Rustem was a strong swimmer, he was easily able to navigate his way to shore. The moral of the story is most demons and evil spirits have some kind of weakness or fatal flaw. You will do well to learn as many of these as you can…by reading many more columns in The Magical Buffet.